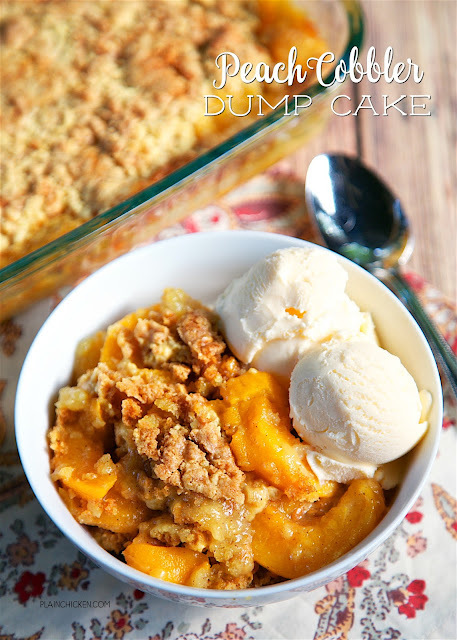 Peach Cobbler Dump Cake - only 4 ingredients for the most delicious dessert ever! LOVE this!!! Literally takes a minute to make and everyone loved it. There were no leftovers! Serve warm with some vanilla ice cream. YUM! Stop what you are doing and make this cake ASAP! SOOOO easy and SOOOOO good! I mean really, really good. 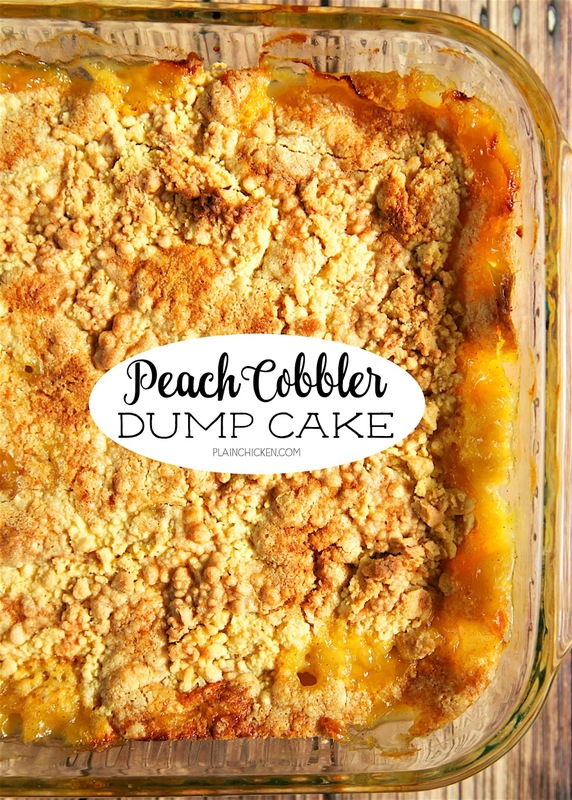 I'm not even a big fan of peaches, but I ate a big ol' bowl of this Peach Cobbler Dump Cake. It is best served warm with a big scoop of vanilla ice cream. Heaven! We were both big fans of this Peach Cobbler Dump Cake. 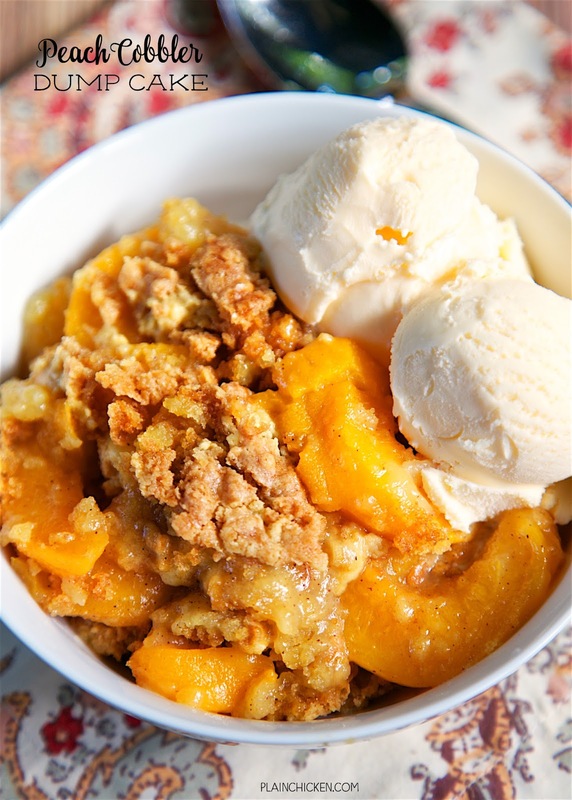 This Peach Cobbler Dump Cake is great for a crowd. It literally takes one minute to make. Seriously! Just dump everything in the pan and it is ready for the oven. It couldn't be any easier! 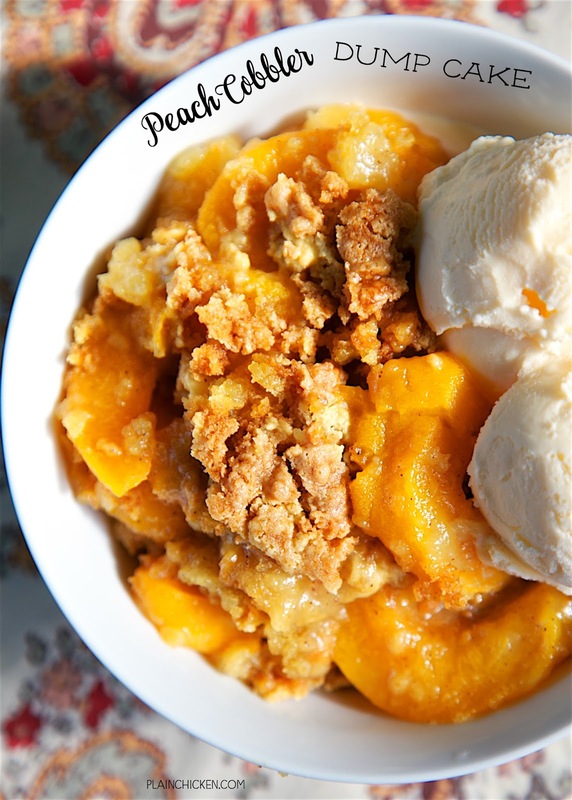 Dump 2 cans of peaches with syrup into baking pan. Drain third can and add peaches to pan. Sprinkle peaches with cinnamon. Top peaches with dry cake mix - sprinkle evenly over the top. Bake 55 minutes to 1 hour or until top is golden brown and fruit is bubbly. Have you tried making this with fresh peaches? Yum!! To address the question above...fresh peaches don't have the syrup needed for the cake to bake. How about using canned peaches in its own juice? would that work? I don't particularly care for peaches in heavy syrup. You can certainly give it a try. Let us know how it turns out. I used peaches in their own juices and it worked great. Can white cake mix be used? Would like to give this a try using fresh vs. canned peaches. Any suggestions as to the ratio? I used about 4 cups fresh peaches with 1 cup of sugar, heated in a saucepan until sugar melts and liquid from the sugar nd peaches comes up to a simmer. Remove from heat added to the prepared pan and followed the rest of the directions as written. It turned out great! can you make this the night before and bake the next morning?